Earn $4.82 in Rewards credit (482 points) What's This? Simplify your shifting with this Narrow Wide chainring. Made from aerospace grade 7075-T6 aluminum, this chainring is light, stiff and durable, perfectly suited to the harsh terrain that your one-by bike will be tearing up. You’ve probably seen more and more of these single-chainring bikes around, striking envy in your heart as they accelerate away from you. The secret to an effective one-by setup is the narrow wide chainring. The narrow wide profile of this chainring shapes the teeth in alternating narrow/wide profiles acts as a chain retention device. The alternating profiles physically grip the chain, using the differences between inner and outer links of your chain to keep the chain from slipping or moving while under load. If you combine this with a modern clutched rear derailleur, then you can kiss that old chain guide goodbye and say hello to the simplicity of single-derailleur shifting. 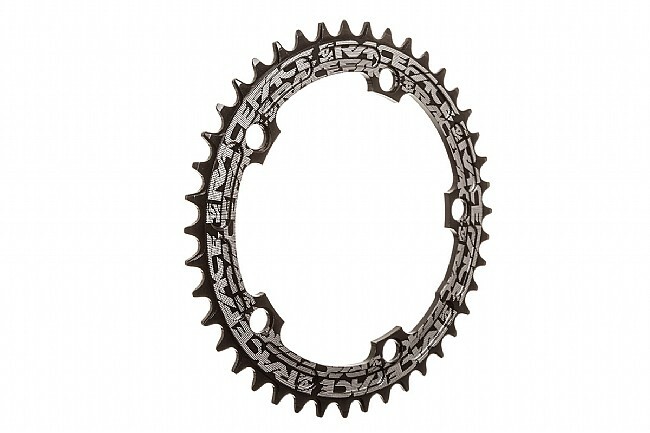 The 130mm Narrow Wide Chainring is available in 40, 42, or 44 tooth versions. 130mm BCD. 56 grams weighed (40 tooth version).